A window covering made from small strips of wood or natural fibers, arranged horizontally and woven together with cotton twine. Woven wood shades are environmentally friendly, made of 100% recyclable material. 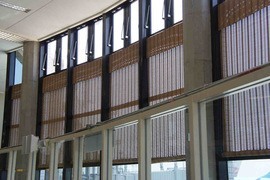 Woven wood shades can cost between $90 and $150 for a 27 inch window.